Sure, your laptop bag may be chic, tough and provide protection for your laptop against scrapes and bumps. But can it fold out into a 1-metre tall ballistic shield, providing instant invulnerability against assaults from "most handgun, shotgun and pistol caliber sub-machine gun threats"? The MTS Multi-Threat Shield, informally known as The Savior, is what the well-dressed man is using to protect himself against sub-machine gun fire this winter. It is, says manufacturer, Force Training Institute, "Light enough to be held by a child, but strong enough to stop a .44 Magnum traveling 1412 feet per second." That's a powerful mental image. But, you're probably thinking, what about if someone rushes you with a bladed weapon, baseball bat with nails coming out of it, or a very big hammer? Don't worry: the ballistic nylon weave and Aramid fibres of The Savior will save ya, from attacks with "blunt objects and edged weapons, as well as punches and kicks." 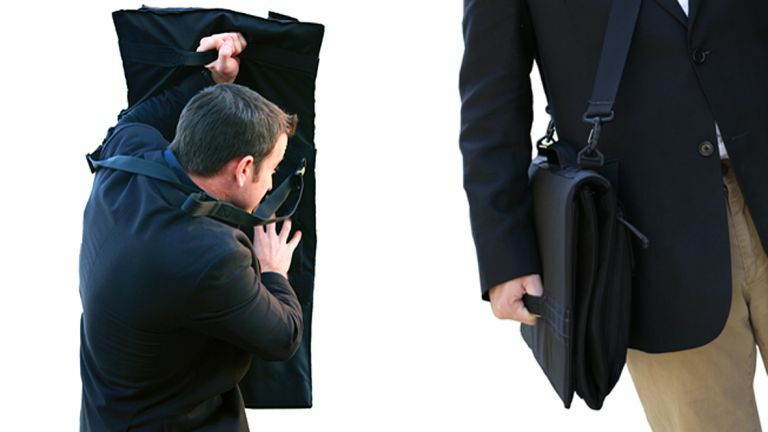 Unfolding in seconds with a flick of the wrist – although this presumably scatters your laptop, pens and laser sights all over the place, as an unfortunate side-effect – The Savior Multi-Threat Shield can also be proofed against high-powered rifles via the addition of a ceramic plate (sold separately). Now savour this dynamite footage of men in Oakley sunglasses shooting a fabric oblong at extremely close range.